Arlette has solely practiced family law since 2010. Her family law experience began prior to graduating from law school when she worked as a law clerk at the family law firm of Cindy Allen and Associates, PLLC. After graduating from law school, Arlette worked as an associate attorney at Cindy Allen and Associates, PLLC in Norman, Oklahoma where she continued to gain valuable experience in the field of family law. Prior to founding Argyris Mah, LLP with her law partner and friend, following a move with her husband to California, Arlette worked at a San Jose family law firm, where she was able to enhance her skills as an advocate for her clients by appearing in court to argue motions, attending mediations and fostering settlement agreements between the parties. She represented clients in all areas of family law, including divorce, legal separation, annulment, custody and visitation, support, complex property division, and domestic violence. Arlette is committed to advocating for clients while understanding the difficulty and stress that they are facing. 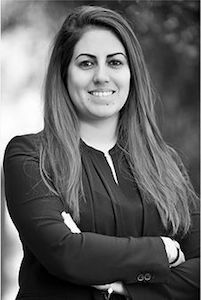 Even prior to graduation from law school Arlette knew that she was devoted to the practice of family law and to helping clients move past a challenging part of their lives. She works to ensure that they have full knowledge and understanding of the law and can move forward to obtain the best outcome possible. Arlette grew up in Oklahoma City and relocated to California with her husband in 2011. In her spare time she enjoys traveling and spending time with her family, including her young son, and friends.